In the fall of 2017 I had the opportunity to attend the 31st Annual Conference of the Hispanic Association of Colleges and Universities (HACU). The conference theme was “Championing Hispanic Higher Education Success: Driving America’s Prosperity”. I greatly appreciated the focus of the event and the extent to which educators from across the nation gathered together to share their discoveries and collaborate with one another for the greater good of the entire educational community. Embedded within the theme of the conference, “Driving America’s Prosperity” was the emphasis on the outcome of prosperity which the nation as a whole stands to benefit, not just Latinos. Educating the largest minority and fastest growing segment of the population is a huge win for Americans everywhere both today and especially tomorrow. Contrary to what some espouse, education is not a competition among competing groups, but a win-win situation for all parties involved. When we view the greater good as a better future for all in light of the interconnectedness of our common humanity and destiny, we can better understand the strategic option to make the whole better by more effectively serving a growing Hispanic student population in need. As educational industry leaders, therefore, we strategically elevate the entire student-centered academic community as a whole when we acquire the knowledge, skills, and abilities necessary to meet the challenge of retaining and graduating our growing Latino student population. Moreover, the challenges we face as educators in Hispanic serving higher education institutions actually create opportunities for advancing, refining, and strategically enhancing student learning experiences both in- and outside of the classroom environment for first generation Latino students as well as non-Latino first generation students. In a sense, the increase of first generation Latino students on campus requires Hispanic serving institutions like Vanguard University, as well as those that seek to do so in the future, to take a real hard look at best practices for student retention and engagement of first generation college students in general. Strategies connected to cross-cultural student engagement at various levels of campus life and culturally sensitive pedagogy truly work to create a more optimal student centered learning environment that ensures Vanguard is a place where everyone can share in a sense of belonging and connectedness. The degree to which students experience a sense of belonging also stems directly from their connectedness to faculty and members of the student body. That sense of belonging is crucial because it serves as a powerful factor in determining student success and retention. Somewhat surprisingly for me, student connectedness to other students plays a critical role in creating a sense of belonging for all students, but especially for our first year students. That is why the current research on first year experience programs even suggests implementing classroom activities that include student to student interaction as part of the instructional experience. On a personal note, I used to question whether or not I needed to include group projects and classroom presentations as part of the curricular experience, since some students always seem to have a problem with another student in the group – real life? But, after attending the HACU event, I was able to understand, rightly so, the multiple ways in which student to student interaction works not just at the level of critical thinking but also at the level of creating a sense of belonging and connectedness. This sense of belonging directly affects student success and retention for on- and off-campus Hispanic as well as non-Hispanic students. Apparently, group projects, pair and share, classroom debates, and classroom presentations are essential components to a successful student centered learning experience. So, I guess I won’t be doing away with the church visit group projects in my Christian Heritage classes after all! Here again, we have just one of many helpful instructional guidelines that correctly demonstrate the way in which attending to the needs of our Hispanic first generation students makes us more effective as educators at attending to the needs of all of our students in the classroom. 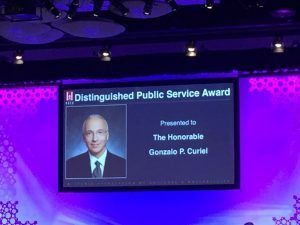 I greatly appreciated Judge Gonzalo Paul Curiel’s (US District Judge, Southern District of California) story about growing up as a second generation Mexican American in the mid-west. The stories about his parents’ hard work ethic and the value of education were truly inspiring!